SOCCEROOS star Awer Mabil hopes to one day link up with AFL star Majak Daw, as the mental health support message behind his goal-scoring celebration goes viral. Mabil doesn't know Daw personally but has connected with the Sudanese-born player on social media in the past. He says the North Melbourne player's fall from the Bolte Bridge on December 17, leaving Daw with a broken pelvis, highlights the silent nature of mental health issues. "As a kid you always want to have everything - play on the highest stage, have the money, have everything," Mabil said. "But as soon as you get that, you realise that either you're alone, or there's something that's not making you fully happy, because it's not about the money or the attention. It's all about your happiness, at the end of the day. "I want to (reach out). But also I have to respect his decision at the moment. That is to give him some privacy for him and his family, and I'm just there to offer myself whenever he needs it." 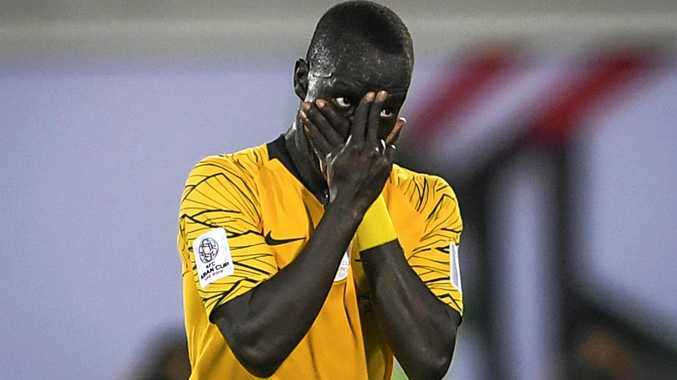 Following Australia's 3-2 win over Syria in Al Ain on Tuesday, Mabil revealed his eye-catching celebration - where places one hand over his mouth and puts two fingers to his face over that hand - was aimed at encouraging those suffering mental illness to speak out. The story has since gone global and Mabil has created a social media hashtag - #amchallenge - to drive his cause. "I'm really excited to see, and also happy that people are taking it on board and liking it. I'm really pleased for that," Mabil said about the response, saying his phone had lit up overnight with texts and messages following his post-match revelation. "To represent those people, now they will know that people actually do care for them and there's people out there speaking about their problems. It's really, it's amazing." Mabil is no stranger to social causes. After growing up in a Kenyan refugee camp before coming to Australia, he received an award last year for his philanthropic work. He and his brother founded a charity called Barefoot to Boots, which provides football boots to kids and also offers education and healthcare outcomes for children in the camp where he was born after his parents fled from Sudan in 1994. Mabil says his goal celebration message was a collaboration between himself and former FC Midtjylland teammate Pione Sisto in Denmark late last year. "He's from Sudan also. We talk a lot and I was just sitting there and I was like, 'I want to create something for people to be aware of, to bring peace to the mind,'" Mabil said. "I just came up with that. From then on, ever since I scored I just did it."